Through the years, I wanted people to see the progress that I saw in Nathan. When friends and family visited, I would be so excited. I would even prep-up Nathan. I would make him sleep well and eat well. I would prompt him to greet people and say things or do things so that his progress with was made more evident. 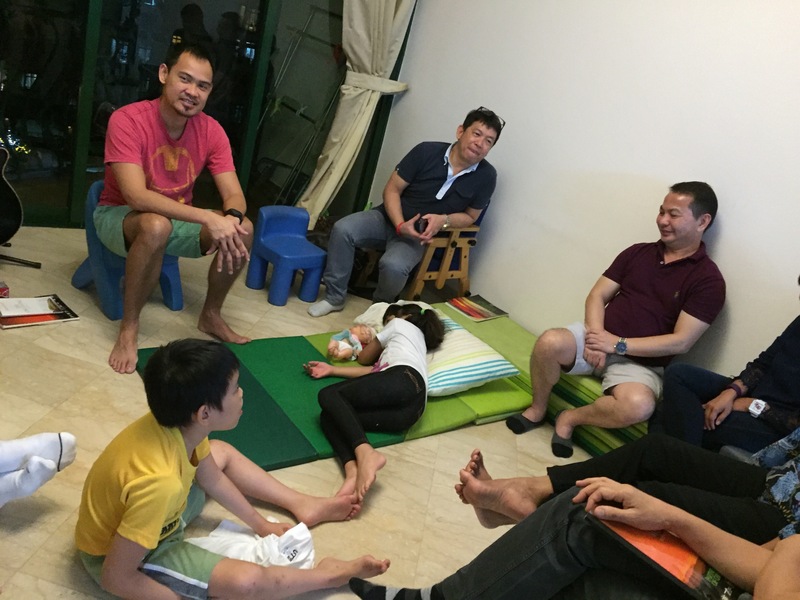 Last week friends came over for a prayer meeting. Lucky I was too busy preparing the house that I didn’t even think of prepping Nathan and boasting to old friends how far he has gone. The night came and Nathan did as he wanted. He jumped with excitement as visitors came…and continued jumping and shouting long after they have settled. Some people might say “Why is he still excited?” Or “What’s funny Nathan?” He grabbed food from visitors’s plates. Without needing to explain to visitors, I just told Nathan that he did a good job targeting and getting what he wanted. He climbed on the table and I celebrated his strength and courage. He shouted his “autistic” words. And I echoed and shouted his words back to him, which made him laugh and say his crazy words again and again for me to echo back. When that was not enough for him, he asked my friend to shout autism language with him. And I coached her to do so, which made Nathan so happy. Nathan wanted more. He asked Tita “Other” to echo, because he couldn’t recall her name. It was crazy autistic yet so fun seeing how happy Nathan was. I realised it’s wasn’t that important for me that Nathan does his best performance and act more typical. What was more important is seeing Nathan happy in a crowd. Finally, I, the parent, have recovered! I have finally let go of my need to see him like a typical child. When we first embarked on this journey, all I really wanted was for Nathan to know that I was right here loving him, even if he didn’t look at me, even if he didn’t respond to his name, even if he had didn’t know who I was, I just wanted him to know that I loved him. Son-Rise has allowed me to “reach” him and show that I love him. The prayer meeting night was an opportunity for me to show him how much I deeply loved him, the way he is today, perfect with his autism, and not for who he will be tomorrow. Yes, I have truly recovered. I’m sure many will ask so I will go ahead and answer: No, I am not ending Nathan’s road to recovery here. I feel that letting go has allowed me to widen his road, making it much easier for him to journey forward. I learn about loving Nathan from knowing how God loves me, complete with my imperfections. With knowing the immense love given to me, I have been blessed with so much more strengthen and endurance to journey forward. In the photo: Nathan decided he wanted to be in the middle of our prayer meeting even if it was past bed time. Amor wanted the same but she went ahead and made herself comfortable.